Many applications for CNTs require properties similar to those of Single-wall, but with the scalability and cost-effectiveness of multi-wall. CHASM’s Signis™ Few-wall CNTs satisfy those needs with a product that is highly conductive, has a high surface area and is easy to disperse. This combination of high performance, low cost and scalable manufacturing make it ideal for a broad range of emerging products. Produced using our proprietary CoMoCAT™ synthesis process. 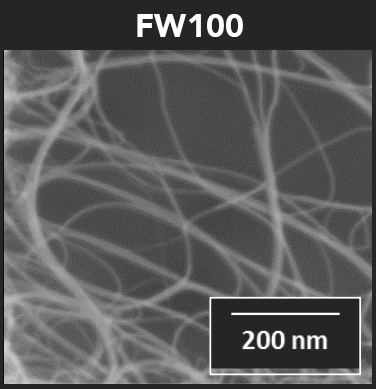 FW100 is engineered to meet the growing demand for a material with the high conductivity, large surface area, and purity of single-wall CNTs, but also with the scalability of multi-wall CNTs. Signis Few-wall CNTs have been specially engineered to contain mostly double-wall and triple-wall CNTs. Applications for Few-wall CNTs currently include advanced battery electrode additives, super/ultra capacitor materials and more. Other product forms can be supplied upon request, including Dispersions, Coating Formulations, Inks, Buckypaper, Coated Films, Patterned Films, etc.